Friday September 11th 1903 I was very busy all forenoon, did churning, cake baking, & made plum butter. Will went to the fair and I went down home. Ott & Mother both some better. Dr Dean has returned. Hattie went to the fair. Mollie went home tonight. weather quite pleasant. Will got a new horse of Earnest Danner today. Saturday September 12th 1903 It looked quite like rain. We went down about eleven oclock. Will went to the fair and I stopped at home. The folks are about the same. I went over soon after dinner to have Dr Dean treat my throat. We came home before it was late. About seven oclock there was a heavy rain. 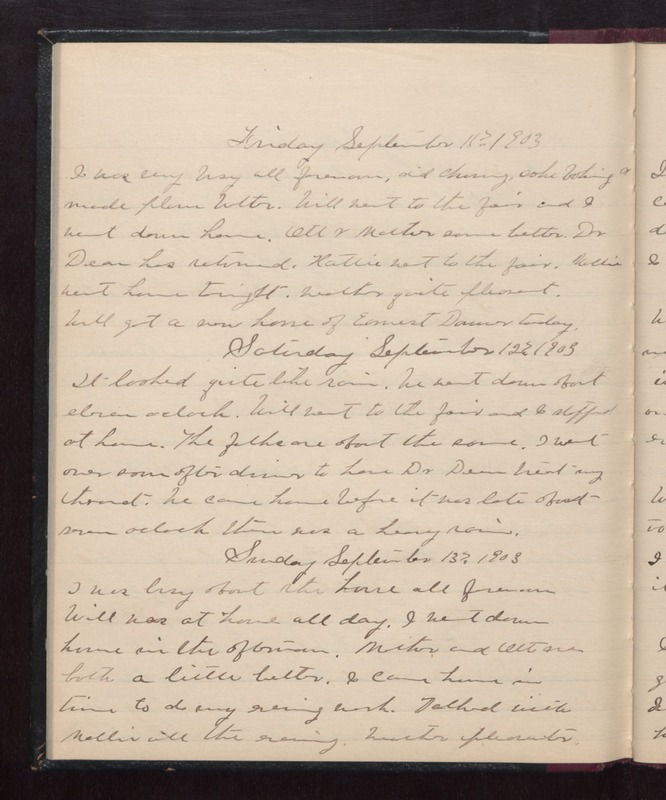 Sunday September 13th 1903 I was busy about the house all forenoon Will was at home all day. I went down home in the afternoon. Mother and Ott are both a little better. I came home in time to do my evening work. Talked with Mollie all the evening. weather pleasanter.